CALIOPOLIS - Research, random thoughts, and slightly articulate ideas on legal education, technology and the Center for Computer-Assisted Legal Instruction. We recently did a soft launch of www.freereporter.org. 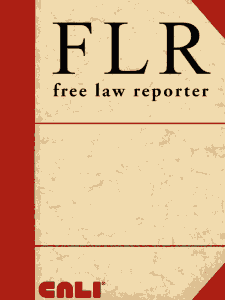 The Free Law Reporter™ (FLR) is an experiment that builds onCarl Malamud’s Report of Current Opinions (RECOP). (more info about RECOP fromJustia,Robert Ambrogi and Ed Walters, CEO of Fastcase). The RECOP bulk feed can be found at http://bulk.resource.org/courts.gov/recop/. 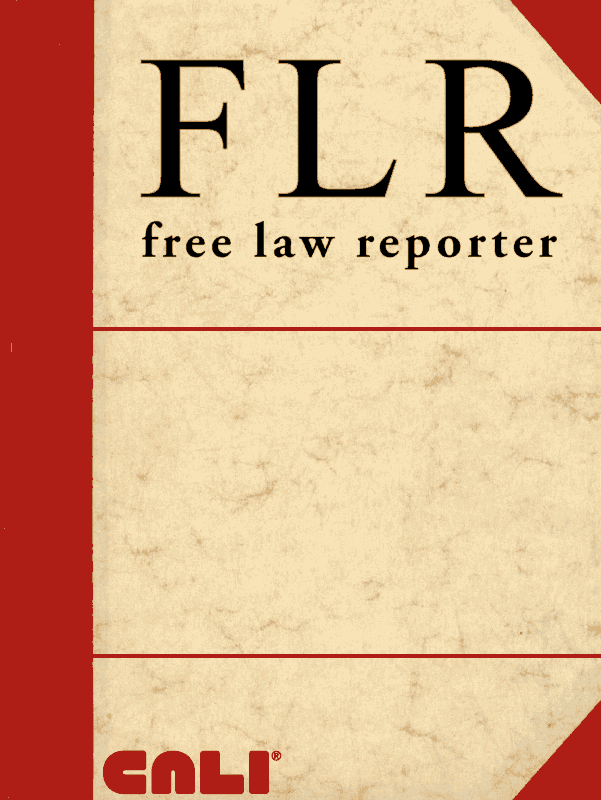 The goal of FLR is to develop a freely available, unencumbered law reporter that is capable of serving as a resource for education, research, and practice. The first step is to use FLR to provide greater access through enhanced and alternate formats of the weekly feeds coming from RECOP. One of the features of freelawreporter.org is that you can do a search for cases and then download all of the results as an epub file. There is a long tradition of “books as databases” … white pages, almanacs, catalogs, etc. and we wanted to explore the idea of the ebook as a portable and perhaps easier to search/read mini-database. We don’t have the resources to do a full-blown Ipad/Iphone app, but by supplying content from the database of cases, we can deliver to these platforms via the Kindle app, Ibooks and other ereader apps. all cases that reference a complex search term – think current awareness as ebook instead of as RSS stream. The Kindle/Ipad can be a better reading experience than Google Reader, though Flipbook has me excited. Controlling the epub from the database – or better yet – letting the user control it – opens up our possibilities of publishing to new vistas. That’s the point, I guess. More on this later. I recently cleaned up my office and decided to organize a huge pile of name tags that I had received from various events, conferences, workshops, reunions and such. 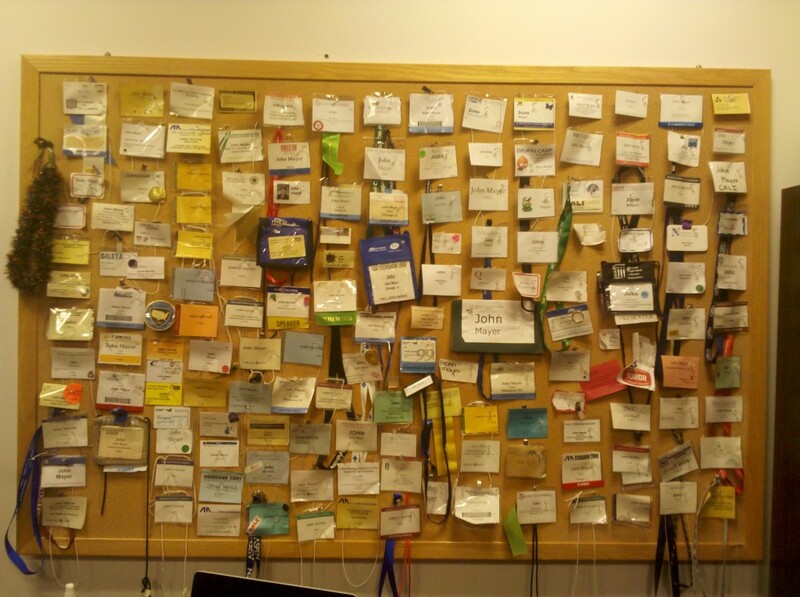 The earliest one is from 1995, so this represents 16 years of name tags. Here is my test podcast. One of the cool things about having a commons that contains public domain versions of case law is that it invites experimentation. I ran across this nifty toy the other day called Wordle (www.wordle.net) that let me create the above graphic. I grabbed a random Supreme Court case from CALI’s Legal Education Commons (www.cali.org/lec or www.legaleducationcommons.org) and produced the Wordle you see above. Can you tell what the case is about? BTW, clicking on the image will take you to the text of the case. I will try to post a new one of these every couple of days just to see what happens as I run various famous cases through Wordle. Here is the link to a screencast of my presentation at AALS on Wednesday, January 7, 2009 in San Diego. I was participating in the "Redesigning Legal Education" session. I had 15 minutes to cover a lot of ground, so I apologize for my fast-talking. The picture does not capture the participants – unfortunately, no one took pics at this year’s Christmas gathering. Some may say this it is better that no pictures were taken if you listen to the singing in the podcast. Click to play or right-click to download. I am back to blogging. I had to take some time off to recover from quintuple bypass surgery. Let this be a reminder to get your cholesterol checked – mine was over 330 last April – now it’s around 150 thankyouverymuch. I’ve been back to work for quite some time now (since May), but I had fallen so far behind that I just didn’t know where to pick up the blog. Well, it’s a new year and I know what my first blog post of 2009 must be…See the next post. "Please Pay Attention" is the working title of the new podcast series. We would love to get suggestions from listeners to name this podcast. Elmer Masters and I talk about legal education-related IT topics several times a week and we have threatened in the past to turn some of those conversations into podcasts because we believe that others might benefit. Alternatively, others might listen and set us straight. So we have followed up on our threat and recorded the first in a series of podcasts. The general topic area is IT in legal education/law schools. We don’t expect to be the only voices on this podcast as we will be inviting "guest speakers" – that is – real IT folks who work at real jobs in real law schools. But for this first podcast, we decided to keep it between just me and Elmer and talk about Drupal (Elmer attended DrupalCon in Boston last week), Drupal, the massively popular open source content management system and related topics on law school website design, development and administration issues. We talk a bit about the planned DrupalFest to be held during the 2008 Conference for Law School Computing on June 18-21, 2008 in Baltimore, MD at the University of Maryland School of Law. Give it a listen, give us some feedback and in a couple of weeks we will see if this a drive-by podcast or we will be repeat offenders. iTunes links to be added soon. Intro and out-tro music is Creative Commons licensed and was found at Podsafe Audio. The artist is Heather Sullivan and the tune is "I Believe".